Get $20 Tickets to Exceptional Events! The Carnegie Hall Notables is a membership and ticket program specifically created for music enthusiasts in their 20s and 30s. The Notables program celebrates music through intimate discussions with musicians, concerts, private performances, and exclusive Notables-only social gatherings. 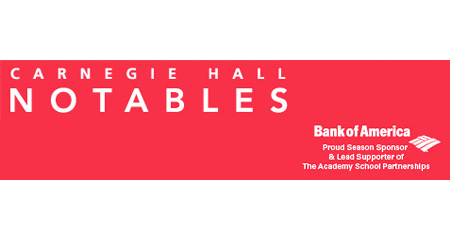 Carnegie Hall Notables members can purchase $20 discount tickets to all Carnegie Hall presentations beginning on the first day of each month, every month. All contributions from the Notables fund the vital music education programs of The Weill Music Institute at Carnegie Hall. Memberships begin at just $20 per year.